Who doesn’t love a piece of cheese cake. But sometimes you don’t want to bake it in the oven and you just want a few small bites. This mini no bake blueberry cheese cakes are just perfect for that! 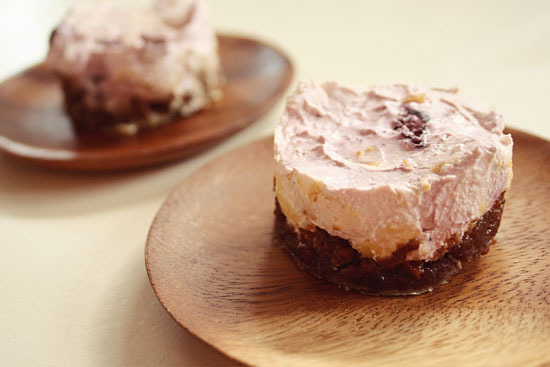 Learn how to make these no bake mini blueberry cheese cakes after the jump. . .
First you have to make the crust. Put the cookies in the food processor until it’s really fine. Then add the melted butter and stir well. Put the crust inside 12 small round molds. I used empty tomato paste cans. Put the crust in the refrigerator until it’s hard. In the meantime put the crème fraîche inside a pot and heat up but don’t cook. Now mix the ingredients for the ‘cheese’. Put some cheesecloth inside a sieve. Place a bowl underneath it and pour the mix inside the cheesecloth. Let stand for about 2 hours in the refrigerator. Now it’s time to put everything together. Put the cheese on top of the crust and remove the molds.